The Content Switch (CSW) is a beautiful feature that enables you to use a single point of entry – your NetScaler – to host multiple services (like XenDesktop, XenMobile and Sharefile). Based on the content (and context) requested the CSW will direct the traffic to the server offering the best service suitable for the task. Since I visit sites that restrict outgoing traffic to known ports (sometimes only port 80 and 443), and only have a single IP in my home lab, I needed a solution that allows me to demo several Citrix products using the same entry point. 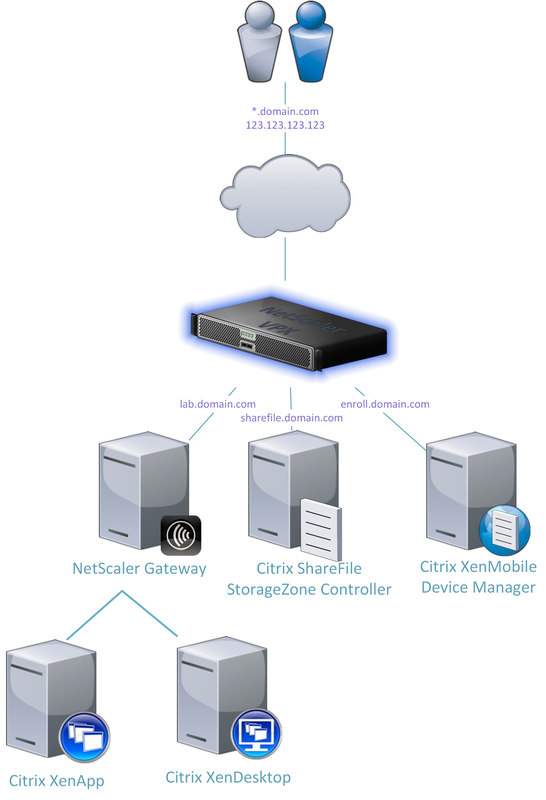 In this article I’ll show you how you can use the CSW to host several Citrix products (XenDesktop, XenMobile and ShareFile) using a single IP and port. Disclaimer: Parts in this setup are not supported and therefore shouldn’t be used in production environments! 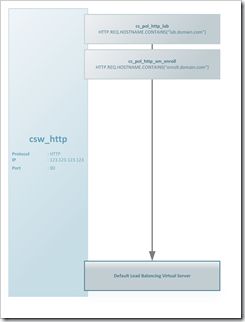 As a point of entry into the NetScaler I use a CSW for each type of traffic where I have multiple services. That means I have a CSW for http:80 (csw_http) and ssl:443 (csw_ssl) which will direct traffic to the corresponding service based on the hostname in the request. add cs policy cs_pol_http_lab -rule "HTTP.REQ.HOSTNAME.CONTAINS(\"lab.domain.com\")"
add cs policy cs_pol_http_xm_enroll -rule "HTTP.REQ.HOSTNAME.CONTAINS(\"enroll.domain.com\")"
add cs policy cs_pol_ssl_lab -rule "HTTP.REQ.HOSTNAME.CONTAINS(\"lab.domain.com\")"
add cs policy cs_pol_ssl_sf_data -rule "HTTP.REQ.HOSTNAME.CONTAINS(\"sharefile.domain.com\") && HTTP.REQ.URL.CONTAINS(\"/cifs/\").NOT && HTTP.REQ.URL.CONTAINS(\"/sp/\").NOT"
add cs policy cs_pol_ssl_sf_connectors -rule "HTTP.REQ.HOSTNAME.CONTAINS(\"sharefile.domain.com\") && (HTTP.REQ.URL.CONTAINS(\"/cifs/\") || HTTP.REQ.URL.CONTAINS(\"/sp/\")) "
add cs policy cs_pol_ssl_xm_enroll -rule "HTTP.REQ.HOSTNAME.CONTAINS(\"enroll.domain.com\")"
add cs policy cs_pol_ssl_netscaler -rule "HTTP.REQ.HOSTNAME.CONTAINS(\"netscaler.domain.com\")"
add cs policy cs_pol_ssl_appcontroller -rule "HTTP.REQ.HOSTNAME.CONTAINS(\"appcontroller.domain.com\")"
A CSW always directs traffic to a Load Balancing (LB) Virtual Server. This means you should always create a LB Virtual Server for each service you’d like to offer. For most services this is a normal procedure (for instance for ShareFile and XenMobile) but for other services this requires some tricks. 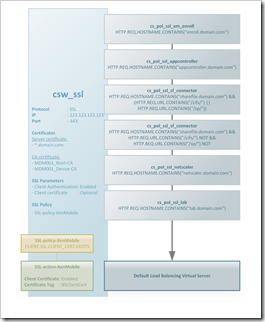 A NetScaler Gateway (NSGW) is a Virtual Server which has a virtual IP (VIP) assigned. As a result you can’t “just” load balance NSGW virtual servers. If you’ll try to create a LB Virtual Service for the NSGW the NetScaller will throw an “Address already in use” error. No worries, there’s a trick to achieve this. Basically we’re gonna fool the NetScaler by making him think he’s load balancing a generic TCP service. We can achieve this by sending the CSW to an SSL LB Virtual Server (lbvs-SSLVPN-http) which in its turn is sending all traffic to a TCP LB Virtual Server (lbvs-SSLVPN-tcp) which sends its traffic to the NSGW. Sounds complicated, but the picture below makes it easier to understand. As I said earlier this is not rather efficient, the NetScaler has to process SSL two times. 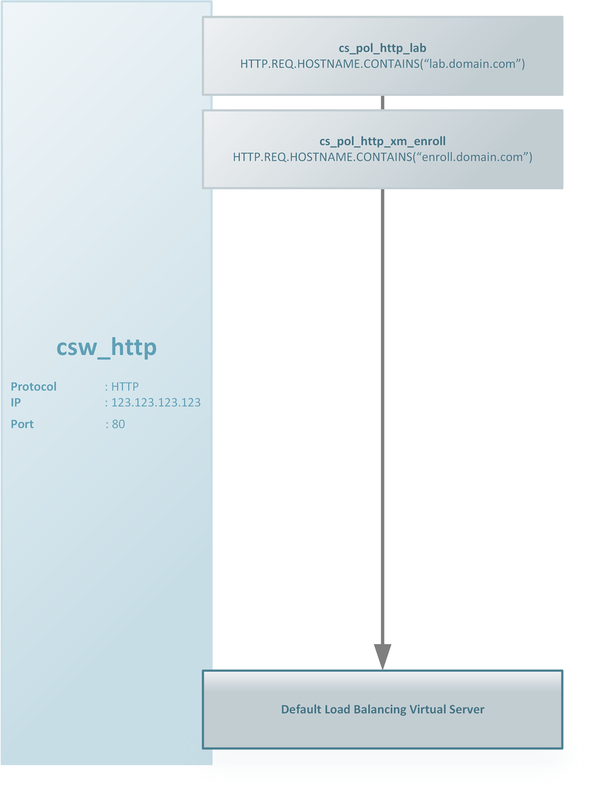 First the content switch (csw_ssl) and then the NSGW (_XD_cag). 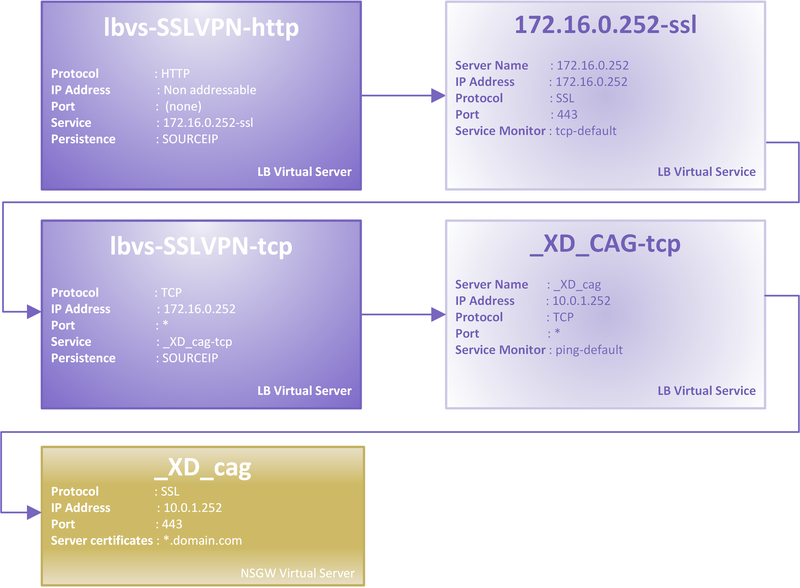 bind lb vserver lbvs-SSLVPN-tcp "_XD_cag- tcp"
PS: The IP 10.0.1.252 is the virtual IP (VIP) of the NSGW and the IP 172.16.0.252 is simply a staging IP. Now all you have to do is create LB service and a LB server (non addressable) and you can use the CSW to direct traffic to the NSIP. bind lb vserver lbvs-localhost-HTTP "localhost - http"
You could use regular SSL certificates for the SSL LB Virtual Servers (lbvs-appcontroler-4443, lbvs-SSLVPN-ssl and lbvs-XenMobile-8443) and the NSGW (_XD_cag) but a wildcard SSL might be just as easy. I used the same content switch for ShareFile and XenMobile and upload/download using Internet Explorer (11 in my case) stopped working. The issue was related to client certificates was enabled – didn’t troubleshoot it much and used two different content switches. Do you have the same issue or is it working for you? Simon, did you configure the client certificate to Optional or Mandatory? I had no problems with both ShareFile and XenMobile. I’m using Netscaler 10.5 VPX and when I try the content switching procedure for the AG it doesn’t work for me. The Access Gateway page is displayed as HTTP only and the login is unresponsive. CS Access Gateway has never worked before also not the the Loop trick, belive me tried it quite often and requested changes to Citrix Netcaler Team. The did with the AG 10.5.x Enhanced Edition out for a month or so Access Gateway Content Switching (AGCS) and basically you bind the CS policy to your AG. 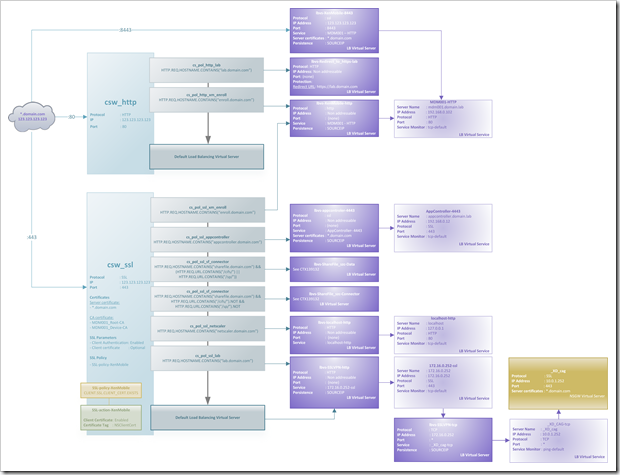 I’m using that but AGCS to MDM doesn’t fully work. First you cannot use offload (SSL all the way) but Event then you get issues deploying apps via MDM. The rest works great so far for ShareFile, RDS-Gateway, VPN, ICA, OWA… only issue is MDM. Thinclient citrix receiver using usb-pxe gives me an error: when I type the IP server: “AM_AUTH_NETWORK”. And when I click on the icon: error 134. Few days ago, I have the error 50. When Ive tried to install the storefront manually, it gave me : AM_ERROR_HTTP_SERVER-CERTIFICATE_NOT-TRUSTED. Ive downloaded the certificate and convert into .pem and placed in the keystore/cacerts folder. So, it sounds to me that Citrix cant read my certificate...I already have other pcs runnining on receiver 13.1 and xenapp 7.5 but not on pxe mode. Thank you for posting this article! I was able to build my own content switching lab and everything is working fine until now (Sharefile still missing, but this will be implemented later). The only exception is Outlook Anywhere which will not connect. OWA and Active Sync are no problem, but when I configure an Outlook Anywhere profile (Outlook 2013 to Exchange 2013) the connection cannot be established. What I have found out so far: If I disable the “client authentication” SSL parameter in the content switching virtual Server, it works – but of course Xenmobile MDM not… It will also work when I start a proxy debug tool like Fiddler on the machine where I have configured my Outlook Anywhere profile. 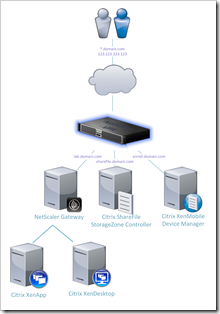 How can I tell my Netscaler not to try client authentication when it switches to the Exchange CAS Server? Or maybe I can disable client certificate authentication in Outlook? I really appreciated… Well done!!! I see this is now fully supported and essentially how Unified Gateway front-ends in NetScaler v11. Great news! Is it possible to run Unified Gateway behind this solution? I also want to use Citrix Receiver adn Receiver for WEB with this solution, possible? 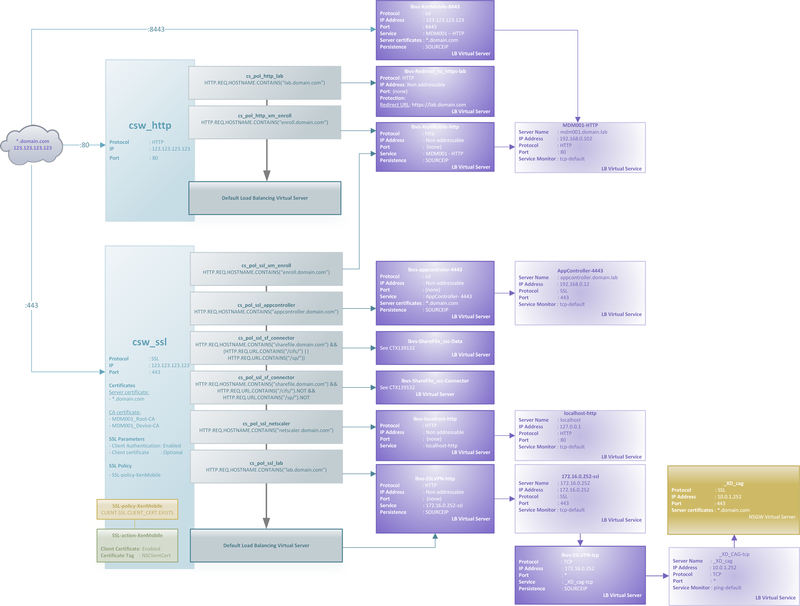 Single external IP with single internal and external FQDN. 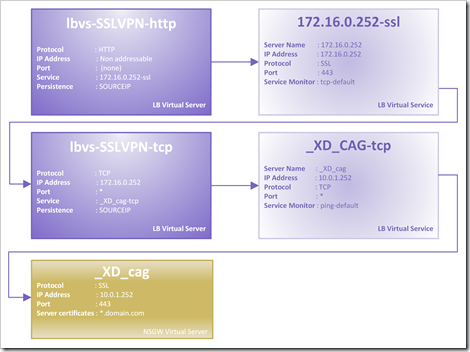 Do I need to have Certificate on the storefront for the Single IP and FQDN to work or can I use http on the storefront and load balance storefront over LB vserver on netscaler with SSL? Has anyone gotten this to work with XenMobile 10 and the MAM functionality? I will echo Frank’s comment – has anyone gotten this to work w/XenMobile 10 and MAM functionality? I have been trying (unsuccessfully) to do so but haven’t figured it out yet. I’m using NetScaler 11 and making my NSG vserver as well as my load balanced vserver unaddressable and I have bound them to my content switching vserver. Ingmar? Is this something you have had success with? Same trying here.. seems that XM10 MAM AG and CS doesn’t work along..